On the 5th and 6th of June, two large-scale controlled pedestrian experiments were performed as part of the ALLEGRO project. The goal of these two experiments was to get insight into the following question: If, how, when, where and under which conditions do pedestrian flows stagnate in a corridor with a bidirectional flow or in a two-way crossing? The experiments took place at the TU Delft campus, whereby during the two evenings about 140 people ranging in age from 18-70 participated. During the first evening, the experiments with the bidirectional flow through a corridor were done whilst on the second evening the crossing experiments were performed. To accommodate the experiments, one of the large exam halls of the TU Delft was transformed to be used as the site of the experiments. Large, 2 meter high, wooden obstacles were used to construct the corridor and the crossing. Multiple cameras were attached to the ceiling of the hall to record the movements of all participants whilst they were walking through the corridor or crossing. 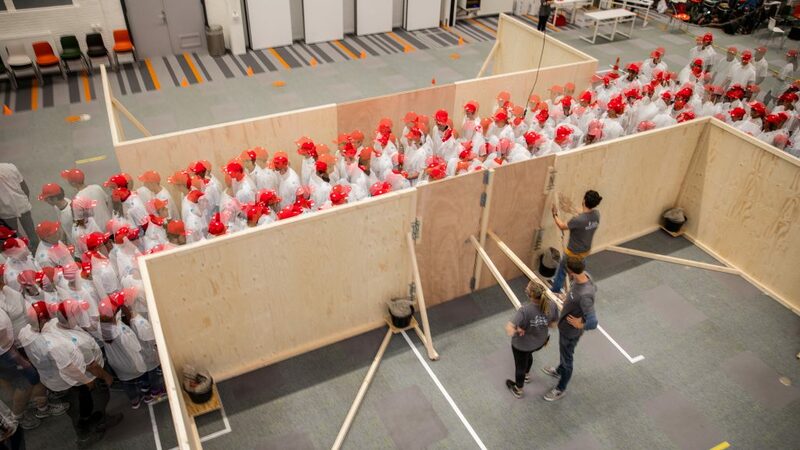 To ensure that the movements of the participants would be captured well by the cameras, they all wore white t-shirts and a red cap, distributed to them at the start of the experiment. The caps also contained a unique pattern which enables tracking of individuals and hence individual behaviour. Also, stickers on the t-shirt, located at the shoulders, enable tracking of the upper-body movements. During both evenings, about 12 runs were performed using different flow ratios and different sets of assignments that the participants had to follow. A total of 6 combinations (two different flow ratios and three different sets of assignments) were tested, whereby every combination was run twice. Overall, this has led to multiple hours of video data which is currently being processed to extract trajectories. As soon as this process is finished, analysis of the data will start.